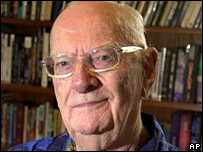 British science fiction writer Sir Arthur C Clarke has died in his adopted home of Sri Lanka at the age of 90. Sri Lankan President Mahinda Rajapakse paid tribute, hailing the writer as a "great visionary". He died at 0130 local time (2000 GMT) of respiratory complications and heart failure, according to his aide, Rohan De Silva. "Sir Arthur has left written instructions that his funeral be strictly secular," his secretary, Nalaka Gunawardene, was quoted as saying by news agency AFP. She said the author had requested "absolutely no religious rites of any kind". A farmer's son, Sir Arthur was educated at Huish's Grammar School in Taunton before joining the civil service. He served in the Royal Air Force during World War II, and foresaw the concept of communication satellites. Sir Arthur's detailed descriptions of space shuttles, super-computers and rapid communications systems inspired millions of readers. When asked why he never patented his idea for communication satellites, he said: "I did not get a patent because I never thought it will happen in my lifetime." In the 1940s, he maintained man would reach the moon by the year 2000, an idea dismissed at the time. He was the author of more than 100 fiction and non-fiction books, and his writings are credited by many observers with giving science fiction a human and practical face. He collaborated on the screenplay for 2001: A Space Odyssey with the film's director Stanley Kubrick. British astronomer Sir Patrick Moore had known Sir Arthur since they met as teenagers at the British Interplanetary Society. Sir Patrick paid tribute to his friend, remembering him as "a very sincere person" with "a strong sense of humour". Tributes have also come from George Whitesides, the executive director of the National Space Society, where Sir Arthur served on the board of governors, and fellow science fiction writer Terry Pratchett. The author married in 1953, and was divorced in 1964. He had no children. He moved to the Indian Ocean island of Sri Lanka in 1956 after embarking on a study of the Great Barrier Reef. There, he pursued his interest in scuba diving, even setting up a diving school at Hikkaduwa, near the capital, Colombo. "Sometimes I am asked how I would like to be remembered," he recalled recently. "I have had a diverse career as a writer, underwater explorer and space promoter. Of all these, I would like to be remembered as a writer." A statement from Sir Arthur's office said he had recently reviewed the final manuscript of his latest novel. The Last Theorem, co-written with Frederik Pohl, will be published later this year, it said.